Current and archived content from newspapers, newswires, transcripts, business journals, magazines, and other publications all from NewsBank's Research Collection. Popular Magazines can be searched via the Library databases - Explora. 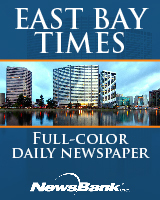 The East Bay Times Image edition is the full-page, full-color newspaper online. It includes photos, advertisements, & articles, and can be browsed or searched. The East Bay Times daily image edition is available (December 18, 2018 - present) in NewsBank. Pictures, graphics, advertising, and classified advertisements are not included in this database. Obituary articles are included, but obituary notices are not. The database is updated daily. Explore issues and events at the local, regional, national and international level. Includes diverse source types including print and online-only newspapers, blogs, newswires, journals, broadcast transcripts and videos. Spanish-language Newspapers: Sources from Florida to California. Articles from other news sources across Argentina, Brazil, Chile, China, Columbia, Ecuador, Mexico, Peru and Spain. Newswires: UPI News Track, Associated Press, CA Newswire, Hispanic PR Newswire, and more. Create Your New York Times Account or Click Log in if you already have an account. with this provider. *If you are not inside the Library, you will be asked to enter your library card and last name. Off-site access is available through 24-hour passes. To continue using this resource, simply log in again. (You will only be asked to create a user account the first time you access this content). Full-text digital scans are available for selected issues of the following newspapers: Antioch Ledger, Byron Times, Concord Transcript, Contra Costa Courier, Danville Journal, Contra Costa Gazette, Contra Costan, Daily Gazette, Daily Press, Danville Journal, Journal (El Cerrito), Martinez Daily Standard, Pittsburg Post, Pittsburg Post Dispatch, Richmond Daily Independent. Locate all newspapers for a specific Contra Costa community or check the different libraries for a specific community newspaper. Contra Costa back to 1870. Dating back to the 1940s. Contra Costa County Library's local history database which features the Library’s collections as well as those of other local history-related institutions, such as historical societies and museums, in order to create awareness of these resources and increase their use.